There is almost nothing to separate Lars Johan Brodtkorb and Charlie Cumbley at the 2017 OK Dinghy European Championship in Faaborg, Denmark. Another win each leaves them just two points apart and 11 points clear of third placed Bo Petersen, the defending champion. Only two races out of the scheduled three were sailed on the third day in Faaborg. Brodtkorb and Cumbley took a win each in their group, while in the other group, Johan Bjorling and Jonas Borjesson won one apiece. With the wind at 10-14 knots and promising more, the first group for Race 6 contained the top three overall and could provide a preview of Saturday’s gold fleet races. Cumbley led at the top but Petersen edged ahead at the gybe mark and led most of the way until Brodtkorb took the lead on the final upwind to win, with Cumbley slipping back to third in a close finish. Luke Gower was the early leader in the second group, but Jan Kurfeld took the lead round the second top mark but then lost it to Bjorling in another close finish. The wind dropped with an approaching cloud but when that passed to the east the wind came back in at 10-14 knots for Race 7. The first group looked like being a runaway win for Borjesson, and he extended until the final upwind, when Kurfeld ground him down and the two crossed the line overlapped, while a third for Thomas Hansson-Mild moved him up to fourth overall. Brodtkorb had rounded the top mark about 20th, but had worked his way through the fleet to finally cross in fourth. The second group was was a fight between Mats Caap, Oliver Gronholz and Cumbley. Cumbley trailed them down the reaches but was back in charge on the second upwind to record his third win of the week. An attempt was made at getting the third race away but a huge shift on the first beat caused the race to be abandoned with Jan-Dietmar Dellas in the lead, and after a further attempt was stopped before the start, further racing was abandoned for the day as the weather won. Brodtkorb is an unknown in the OK Dinghy class and it showing a remarkable skill in the boat at his first event after just a few days training before this event. He is normally a Europe and Finn sailor, having won two Europe Worlds in recent years. He says he will maybe sail the OK Dinghy in the future given the chance, but his immediate focus is on his studies and the Finn U23 and Gold Cup next month. 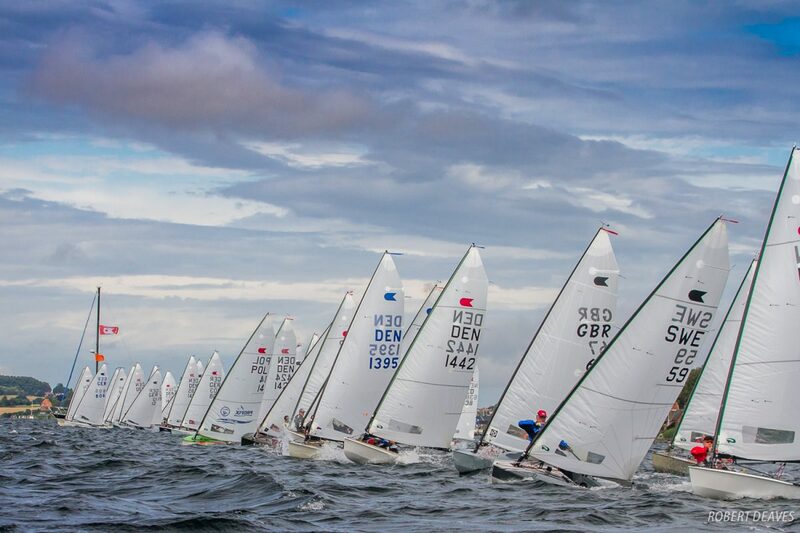 The championship is a major triumph for the Danish OK Dinghy association, which has grown at a faster rate than any other national class worldwide in the last few years. Jesper Strandberg has been a large part of that, building some beautiful boats and explained that Faaborg was an easy choice as the venue for the Europeans. Racing concludes on Saturday with the fleet now split in gold and silver fleets based on their results so far. The forecast is for strong winds, and even though the top two have a nice gap, in the OK fleet take nothing for granted.